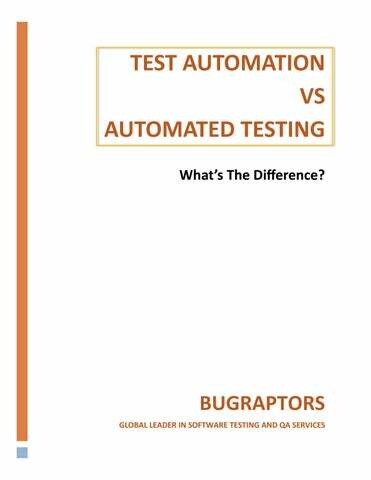 TEST AUTOMATION VS AUTOMATED TESTING Whatâ&#x20AC;&#x2122;s The Difference? Firstly, What Is Automation? Well! It Means Using A Specific Technology To Accomplish A Task. These both terms look so similar to say, but Automated Testing is the work of executing specific tests through automation (for ex: a regression suite) in contrary to running them manually. Whereas, Test Automation means automating the steps carried out for management and tracking of various tests. automated tests. 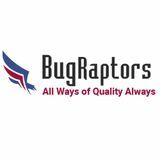 It consists of complete automation of the test cycles. the Developers, Testers, and DevOps. levels. The cycle generally comprises a list of steps which are followed according to the process. “Which One Have More Importance?” Test Automation or Automated Test Well! The answer lies in the definition of both terms itself. Without automated tests, the testing part of Test Automation process cannot be completed. Same goes vice-versa too, that if there is no Test Automation, then the automated tests would not be planned properly for their place of usage. So, it is concluded that both are required for successful delivery of software with all the new changes that are adding up to it, without unnecessarily eating up the QA’s and other team members’ time. Automated Testing vs Test Automation - What's The Difference?